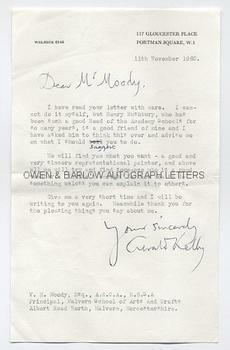 GERALD KELLY R.A. Typed Letter Signed. British painter, best known for his portraits. Sir Gerald Kelly was president of the Royal Academy from 1949 to 1954. TLS with AUTOGRAPH additions and correction. 1p. 117 Gloucester Place, Portman Square, W1. 11th November 1960. To Victor Hume Moody. "I have read your letter with care. I cannot do it myself but Henry Rushbury, who has been such a good Head of the Academy Schools for so many years, is a good friend of mine and I have asked him to think this over and advise me on what I should suggest you to do. We will find you what you want - a good and very sincere representational painter, and above all we will try and find some-one who is a good teacher. It isn't enough to know how to do something unless you can explain it to others. Give me a very short time and I will be writing to you again. Meanwhile thank you for the pleasing things you say about me." Gerald Kelly has struck through the typed word "tell" and inserted the word "suggest" in manuscript. 8vo. Approx 7.75 x 5 inches. Fine. From the studio archive of Malvern artists Victor Hume Moody and his daughter, Catherine. V.H. Moody was principal of the Malvern School of Art (1935-1962), in which position he was succeeded by his daughter. He has been described as "the last classicist painter" and both he and his daughter were opposed to the onset of modernism in art. Sir Gerald Kelly appears to be responding to a request for help in finding a visiting teacher for the School, a position which we believe was eventually filled by the artist Henry Carr.